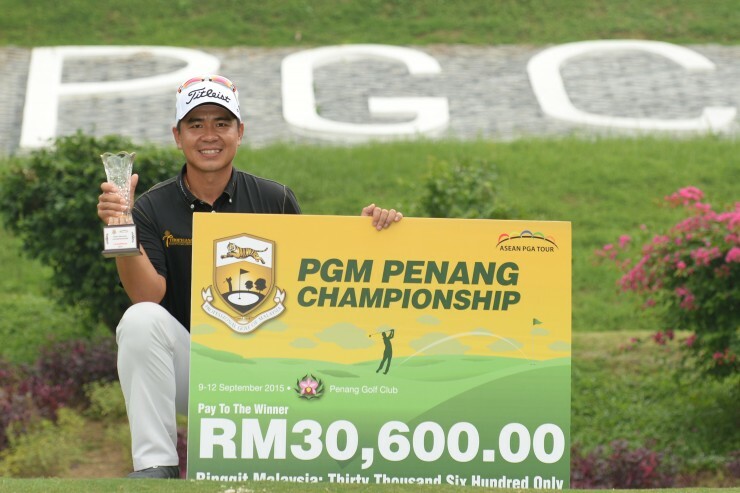 Khor Kheng Hwai won his maiden Professional Golf of Malaysia (PGM) Tour title when he captured the PGM Penang Championship at Penang Golf Club in his hometown today. Playing in the championship, or last, group, Khor fired an impressive six-under 66 to finish on 13-under 275 and win by a stroke from Nicholas Fung, who was runner-up for the second successive week. Khor’s round had only one blemish, a bogey on the 72nd hole, but he also had seven birdies on the card, and that proved enough in the end to secure the island title and a cheque worth RM30,600. Delighted with his first victory on Tour at the age of 31, 10 years after he turned pro, Khor said: “I’m just so happy to have done it at last. Following his second-place finish at the I&P Group Closed Championship at Kinrara last week, Fung was forced to settle for the runners-up spot again. He closed with a 65 for a 12-under 276. His low round of the day came by way of seven birdies without blemish. Mohd Amli Mohd Mohiyedeen (68), Iylia Jamil (Mas) (72) and R Nachimuthu (72) were joint third on 278, while SukreeOthman wa sisxth on 279.